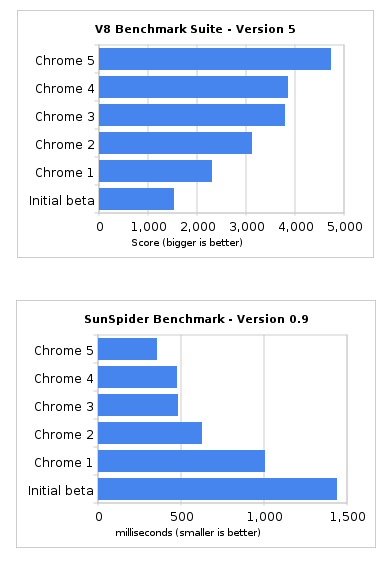 Google has released yet another version of Chrome, their web browser, and their official blog post claims that this beta is the fastest Chrome to date. Improvements have been made for all OS versions of Chrome. New HTML5 features: Geolocation, App Cache, web sockets, file drag-and-drop. The “web standard of the future” is getting further attention from Chrome, as expected. Integrated Flash Player Plugin: users will no longer need to visit the Adobe site to obtain the Flash player plugin because Chrome comes with the plugin preinstalled. This beta is the first Chrome to have Flash built-in, a step aimed to improve stability and security of Chrome. V8 performance improvements: the new beta demonstrates an improved speed on V8 benchmark testing (30% to be exact). From Chrome’s initial release, that brings the speed improvement up to 213% on the V8 benchmarks. Preferences synchronization: in addition to being able to synchronize their bookmarks across computers, users will now also be able to transfer their settings from one Chrome to another. These transferable settings include home page, personal preferences, themes, startup settings, and default languages. It is evident that the new beta is the most superior version of Chrome yet. You can get it by clicking here. Google’s official blog post on the release can be read here.